The worst part of being dead is that there’s nothing left to live for. No more kisses. No more secrets. No more gossip. It’s enough to kill a girl all over again. But I’m about to get something no one else does - an encore performance, thanks to Emma, the long-lost twin sister I never even got to meet. Now Emma’s desperate to know what happened to me. And the only way to figure it out is to be me - to slip into my old life and piece it all together. But can she laugh at inside jokes with my best friends? Convince my boyfriend she’s the girl he fell in love with? Pretend to be a happy, carefree daughter when she hugs my parents goodnight? And can she keep up the charade, even after she realizes my murderer is watching her every move? From Sara Shepard, the #1 New York Times best-selling author of the Pretty Little Liars books, comes a riveting new series about secrets, lies, and killer consequences. This series is really addictive and while I had guessed pretty quickly who the killer was I really wanted to listen to the rest of the series-- hear how it played out-- and confirm my suspicions. This is not at all like the short lived television series. 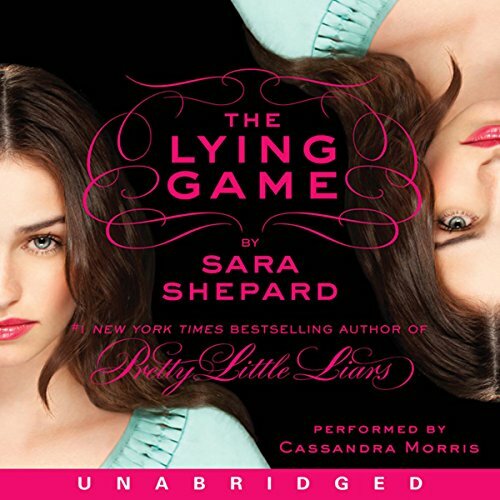 Would you consider the audio edition of The Lying Game to be better than the print version? I have not read the print version of this book, so I am unsure of the difference. Would you listen to another book narrated by Cassandra Morris? Perhaps. Listening to this one sometimes made me feel like I was trapped in a 15 year old's conversation...which was sort of annoying. The story was interesting. I enjoyed the story enough to really consider listening to the next one. The concept of the Lying Game was certainly different, and there were enough twists and turns to keep it good. Would you listen to The Lying Game again? Why? Yes- This is a great book. Love this series so much!! Where does The Lying Game rank among all the audiobooks you’ve listened to so far? I really don't know. I love books so much that I have a hard time telling which I like better. What other book might you compare The Lying Game to and why? Hmm, hard one. I would probably compare it to any mystery/chick lit novel out there. I loved the scene where Emma tells Ethan who she really is, thus making him help her. When Emma realised her only family member is dead. That touched me a lot. The way she felt, really made me sad for her. I think this book is really awesome. Forget about the TV Show. This is so much better. This book was engaging and I can't wait for the next one. The only reason it may have been difficult to follow is because, the book is written from the dead sisters perspective. Soo There are twins who were separated at birth, one went into foster care, the other one was murdered and is now a ghost. This story will keep you on the edge of your seat and guessing the whole time. Pay attention and you will love it! Her voice was grating and distracting - couldn't get into the story. Not that it was easy to track, anyway. I got the book because I love the short lived tv series and thought it was cool that it was based on a book series. I enjoyed the book. Cassandra Morris did a good job at narrating but her voice is a little too young for my taste. I usually like older people narrating books. I thought I would get used to it but I guess I didn't other than that the book was a fun listen. I also think it's cool that the lady who wrote Pretty Little Liars wrote this series. This book was so good I’m not the type of person that likes books but this is one of my favorite books I’ve read in a while. The plot is a pretty standard twin swap plus murder mystery. It's not badly done but there's nothing new. The ghostly twist could have lead to clever story telling by allowing the narrator to know things not known by the protagonist. Instead, it's largely irrelevant due to ghostly amnesia - a missed opportunity for novel narrative structure.